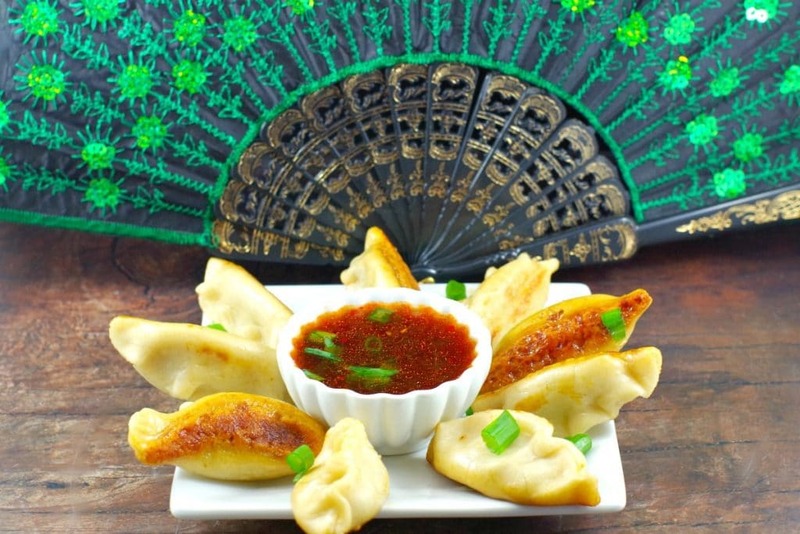 You are here: Home / Recipes / Appetizers / Chinese Potstickers (Dumplings): Happy Lunar New year! Chinese Potstickers (Dumplings): Happy Lunar New year! 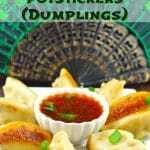 I have always loved Potstickers, or Wor Tip or Chinese dumplings, as they are also known. Hell, being Ukrainian, I love anything that even vaguely resembles a perogy! And every culture seems to have their own version of the dumpling. But in the Chinese culture, dumplings are considered good luck food, as they symbolize wealth and good fortune. My dumpling good luck came several years ago when I had the chance to learn how to make them from the masters themselves! Many years ago I worked at a Chinese restaurant (you can read about that experience HERE) and when they saw how crazy I was for Wor Tip, the cooks invited me into the kitchen to learn how to make them. This was a real stroke of luck because these guys had been making authentic Chinese Food for 30 ish years already! And the recipe for these authentic Chinese Potstickers were the delicious result of that experience! 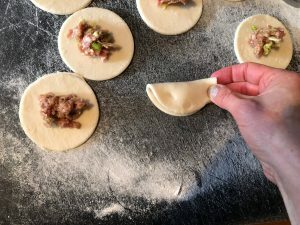 Although making potstickers is similar to making perogies, there are a few differences, specifically in the folding (see video at end of recipe) and cooking method. Potstickers are a type of dumpling, but not all dumplings are potstickers. 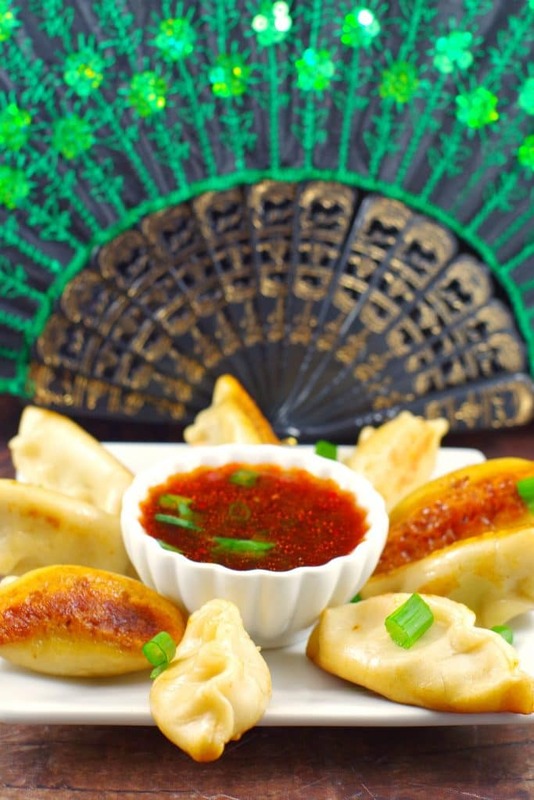 Asia produces some of the most well-known dumplings, including won tons, pot stickers and gyoza (a Japanese dumpling). 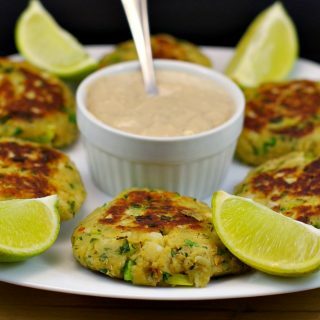 Potstickers are a type of Chinese dumpling distinguished by a specific method of cooking, where they stick to the sides of the wok or pan and are browned on one side only. Potstickers, like dumplings are steamed, but also lightly browned in oil until they are mildly crispy and sticky. 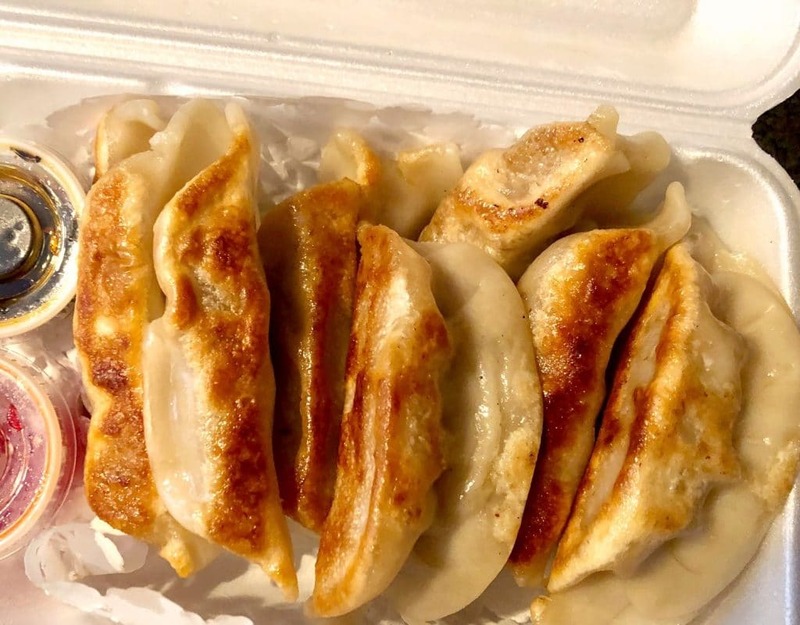 Gyoza, the Japanese version, are also cooked in a similar manner, but they are a little smaller, the meat is a finer mince and the dough/wrapper is thinner. You can read more about dumpling differences HERE. Chinese dumplings symbolize wealth because their shape is similar to ancient gold. While Asians celebrate the Lunar New Year in different ways, all celebrations have one common feature: family reunions. Traditionally in the Chinese culture, members of a family get together to make dumplings during New Year’s Eve. New Year’s Eve dinner is the most important holiday dinner in China and many other Asian countries. Eating out is expensive and I love being able to make these Chinese dumplings at home myself because I can never get enough in an order from a Chinese restaurant! This is a recent order I got from a restaurant, although they’re delicious, they cost over $12 for only 10 dumplings! 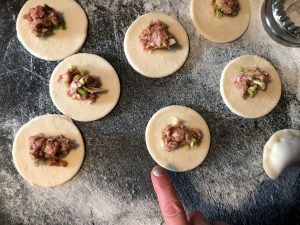 Like pierogi making, this is a really fun activity to do as a family and you could even make it into a dumpling party. I have done a few perogy parties in my time and they are a blast. Plus, everyone pitches in a leaves with a bunch of dumplings! 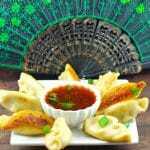 These homemade Chinese Potstickers make a wonderful appetizer or snack for Chinese New Year but are really great any time of the year! If you’re looking for the perfect meal to serve with this appetizer, give my 20 Minute Hoisin Orange Chicken a try! 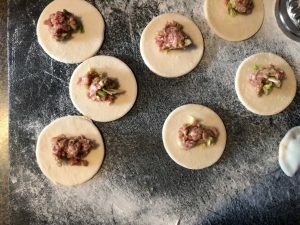 These authentic Chinese potsticker (dumplings) are made with ground pork, Chinese cabbage, green onions and ginger,a quick, homemade dough then pan fried and steamed with a homemade potsticker sauce! Place flour in large bowl and make a well in the center. Pour in the boiling water, stir with a wooden spoon until dough hold together. 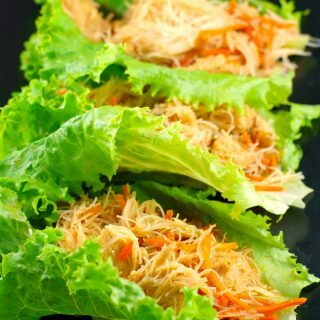 Combine finely chopped cabbage, pork, onion, soya sauce, cooking wine, ginger, cornstarch, 1/2 tsp oil, sugar and mix. lace 1 tsp filling in the middle. 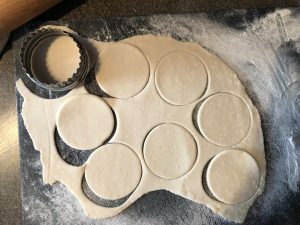 To Shape: Moisten edges of dough circles with water. Fold in half and pinch and seal. * If you have ever made perogies, it's very similar. Cover and finish the remaining. To fold in traditional manner, WATCH VIDEO BELOW! Heat 1 tbsp of vegetable oil over medium heat in a large non-stick frying pan. Place half the dumplings in the pan (seam side up) and cook until bottom are brown (approximately 5 minutes). Pour in 1/3 cup of chicken broth and cover with tight fitting lid. Reduce heat to medium- low and cook until liquid is gone (approximately 10 minutes). Cook the 2nd half with the remaining ingredients in the same manner. Add hot chili sauce and Chinese red vinegar together and mix. Add a little water (to your liking) if it's too strong for your taste. Garnish potstickers and dipping sauce with green onion.